Independent of the people Tags functionality of other modules, you can also easily group together small groups into Tags too; ideal for mass-communicating with members of all the groups within a group tag. Tags are especially useful where you wish to group together and categorise certain types of group e.g. "prayer groups", "outreach groups", "social action groups". 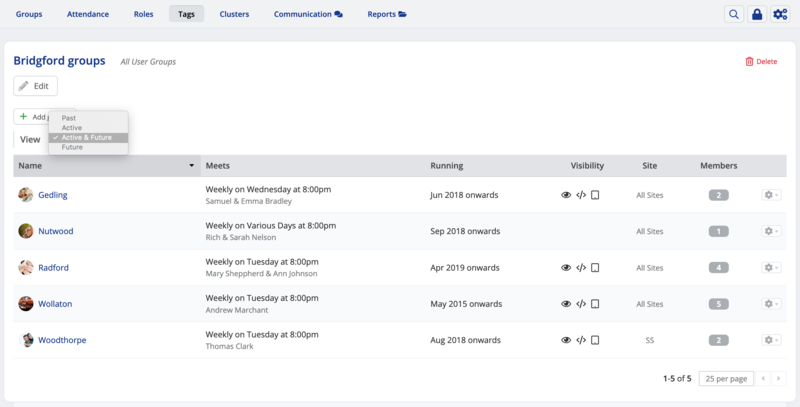 Group Tags can also be used as filters when viewing reports in the Small Groups module, and group Tags can be used to filter lists of groups when viewing the Group List in Connect and Small Group Embed lists. Navigate to the Tags section of the Small Groups module and select Add tag. 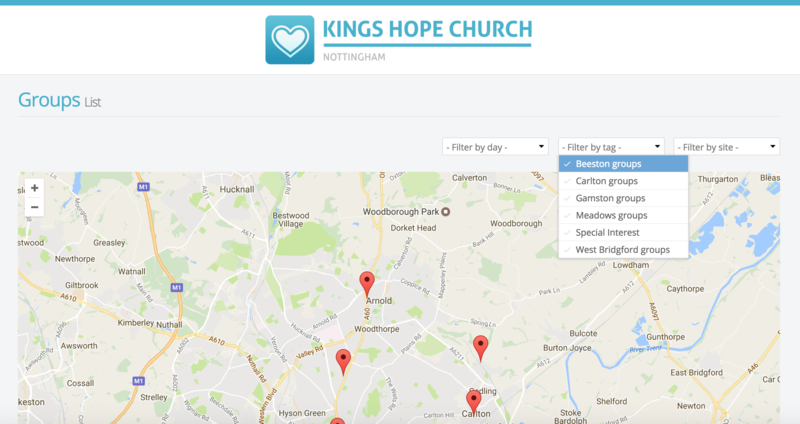 On the Add tag pop-up, give your tag a suitable Name, set an optional Colour (for easier visual categorisation of tags) and set who the Tag is Visible to within ChurchSuite e.g. if you wish to retrict the tag visibility to just certain user groups. Click Save to add you new Tag. After saving, you're taken to the Tag page. Here you can click to Add groups to the tag. You can only add Active or Future groups through the Tag page; however, you can still assign Past groups to a tag by editing the group (in the Groups section of the module) and assigning the tag via the group's edit page. Once a group is tagged it will remain tagged until untagged, even if the group's end date passes. A group can be assigned to multiple tags, and of course you can assign multiple groups to a single tag. Use the Add groups option to add groups, either one at a time, or to add multiple groups in one go. Click the Add button to save the changes and add the selected groups to the Tag. The tag page lists all the tagged groups. Note the option to switch the View between seeing Past, Active, Active & Future, and Future tagged groups. You can edit an existing tag at any time, perhaps to change the tag's Name, Colour, or Visibility - click the Edit button at the top of the tag page. You can easily communicate with the people in tagged groups from the Small Group module's Communication section. Note the drop-down Search selector to switch between searching by Groups, Clusters or Tags. Having selected one or more tags to communicate with, you can now select the members you wish to communicate with - either All Members of the selected tagged groups, or By Role - perhaps to communicate with just those members that have a "Leader" role in the selected tagged groups. And then finally you will select what you want to do with the selected tagged group members - perhaps to send an Email or SMS. Once you have created Group Tags and assigned groups to them, they can be used as filters in reports in the Small Groups module. In this example the Group Members report is being filtered by groups in the "Bridgford groups" Group Tag. Group Tags can also be used as conditions with Smart Tags - notice the use of the In tag condition Option for the Small Groups Module. Tag conditions can be inverted, selecting the red X rather than the green tick, which will return people NOT in the selected Group Tag. 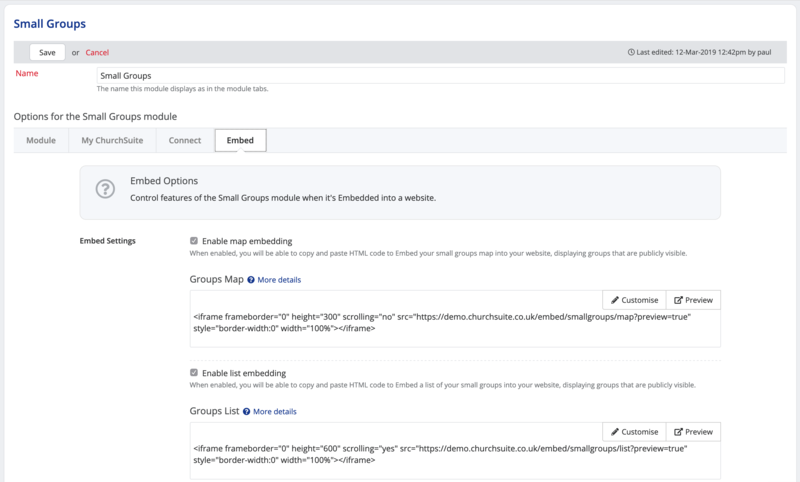 Group tags can be used as a helpful filter in the Connect Group List application, to help those searching for a small group to search based on group categories. For example, you could create tags for "Groups for Men" and "Groups for Women" and "Groups for Families" and then tag each small group as appropriate - a small group can have more than one tag. The tag filter can be disabled in the Small Group module settings on the Connect tab. The same principle applies to any Groups Map or Groups List that you might have embedded on your website. 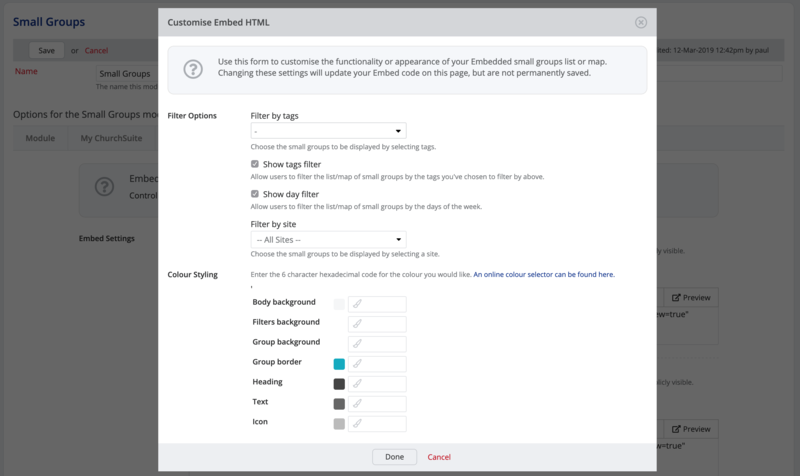 To enable the group tag filter in Embed you'll need to customise the embed code using the embed code generator in the Small Group module's settings on the Embed tab (shown below). Click on the Customise button for Group Maps or Group Lists and there you can customise the embed code, ticking the Show tags filters options (and also the Show day filter and Filter by Site options if you wish). When you save the Customise Embed HTML page, the embed code is updated and can then be copied and pasted into the source code section of a page on your website.